The 16th edition of Toronto's Hot Docs Canadian International Documentary Festival, opened April 30 and will run to May 10. From a record 1948 film submissions, this year’s slate offers 171 titles from 39 countries in 10 programs. Thursday, April 30, for the first time "Hot Docs" expanded its Opening Night celebration to include a VIP cocktail reception at the historic Elgin Theatre on Yonge, followed by a screening in the Winter Garden of Jennifer "Manufactured Landscapes" Baichwal's "Act Of God". 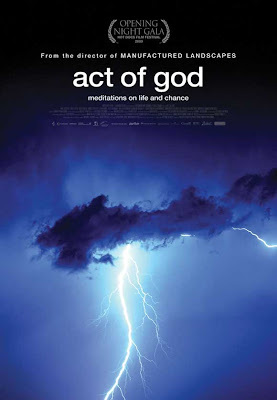 "Act Of God", a Canwest-Hot Docs Funds Recipent, best described as 'a visually and aurally seductive reverie' is an electrifying new film, exploring the metaphysical effects of literally being struck by lightning. "I can't accept that it happened for a reason," said James O'Reilley, who was hit by a strike and survived. "Nor can I really accept that there is no reason. The only way to carry on is to be humble and a little bit in awe of these things you can't really understand." For writer Paul Auster, involved in a strike at age 14, being hit by lightning deeply affected his life and art. "It opened up a whole realm of speculation that I've continued to live with ever since."